Umbrellas—designed as a convenient solution to getting caught in the rain—can be surprisingly unwieldy. On a stormy day, Philly sidewalks are filled with all shapes, sizes and varieties. But, when the wind is strong, the flimsy shields often can’t withstand the pressure, acquiring that all-too-familiar inside-out look. At that point, the city becomes an umbrella graveyard. Local artist and eco-enthusiast Taryn Zychal finds opportunity and inspiration in a situation that makes most people crazy—she collects broken umbrellas and turns them into her own unique line of fashion under the moniker Recycling Zychal. Zychal, who moved to Philadelphia from Scranton to pursue a degree in Industrial Design at the Art Institute of Philadelphia, runs Recycling Zychal from her basement apartment near Rittenhouse Square, where she lives with her pet pugs. She designs and produces stylish, functional apparel for pets and humans using salvaged fabric from umbrellas, selling the finished wares on Etsy.com. Customers choose from a variety of samples on the site, send in their measurements and Zychal makes the pieces to order. 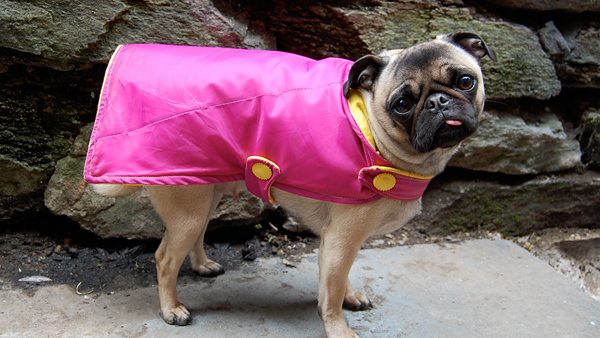 Her most popular products are the Upcycled Umbrella Dog Rain Coat and Winter Dog Coat. Her “HOOD” for women—which she describes as a “modern-day babushka”—is also a huge hit. As one would imagine, scavenging for supplies isn’t the most glamorous task. Zychal and her fiancé wait for the strongest, windiest storms before hitting the streets. They gather abandoned umbrellas by the bagful, leaving no trashcan unturned. Zychal lets the umbrellas dry for several days, detaches the fabric, then washes them with lavender and lemon essential oils. This cleanses the material, leaving it with a relaxing, non-irritating scent. In addition to the umbrella linings, Zychal uses Eco-Fi felt (a polyester fiber made from recycled plastic bottles) and vintage or handpicked fabric remnants she finds down on Fabric Row to create her finished pieces. With the success of her Etsy line and many satisfied dog-owning customers, Zychal plans to expand her repertoire—she’s currently working on a stylish kitchen apron for men—and hopes to customize items for local stores. She’s thrilled that the venture has taken off and loves running what’s become a booming small business.